Any owner of Taylormade products knows what they are getting; durability, high end features and a design made to kill. The M2 2017 clears all of those checkboxes and more. After a few swings it will become one of your favorite daily drivers. This high priced driver is available in left and right handed versions. The full M2 line is really something to marvel at, with a lot of the focus being centered on its Geocoustic engineering. With that in mind, this may very well be the best club from Taylormade, or at least their most popular series. Like all clubs of this type, the M2 is built on accuracy and a large gap in forgiveness when making mistakes. It feels good while swinging, and allows the user to really experiment with the finer parts of their game. Even if you are set with your current favorite club, the M2 is a totally different beast that is worth the buy. This has been debated a bit by users, but the M2 2017 is more for intermediates and professionals. That doesn’t mean it is too much club for beginners, but it does mean that there are better choices for players that are just starting out. The M2 2017 is meant to be in the hands of users with experience so that they can fully utilize its feature set. Taylormade is an American golf company that manufactures golf bags, clubs and accessories. Their clubs started with the success of their metal drivers, which of course remains their bread and butter. The debut of their driver in 1979 was an innovation then, and today the company continues to lead the pack with their great club selection. It’s hard to believe that all of this started with Gary Adams borrowing 24,000 against his house. That big gamble became the lifeblood that Taylormade was found on. The M2 2017 can handle a lot of abuse without sustaining a lot of damage. There is a little bit of weight to help with the durability. Most of it has been transferred equally over the entire club, with the head remaining light as a result. The revolutionary materials used to create the club keeps it from being overly heavy yet gives it the same ‘old school’ feel of a club made several generations ago. Users that are looking for durability only will find the M2 series reached its peak with the 2017 version. Even the most abusive golfers in the world won’t be able to crack the rough exterior of this club. The price is high, there is no getting around that. No matter which model of the M2 you get the price will be in the same range or higher. This is one of Taylormade’s top series, so of course the price is going to reflect it. Buyers that are looking for something to reinvigorate their game won’t have any problem paying the high price for the M2’s. Considering what the rest of the industry has to offer, this is right in line with some of the best. Materials used to make up multiple parts of the M2 2017 is an interesting story. It features a 9-1-1 Titanium body combined with a six layer carbon composite crown. It is thick and sturdy without adding too much weight to the overall product. The dual feel grip gets the same amount of care as the rest of the club, and it really comes together into one complete package. Even if you play in the rain, it really won’t accelerate the age of the product. As a comparison, it is similar to last year’s M2, but with less weight. It’s hard to put the brilliance of the M2 2017 design into words. Yes, it is similar to the previous generations design. But that doesn’t mean that it still isn’t a joy to look at. The M2 retains the polish of the series without adding changing too much. Its black/gray look is not drab, as there are a few bright colors used as accents on the head. Everything goes well together, but what knocks it out of the park is the new Geocoustic design. The shape of the head is perfect, with just the right amount of size needed for maximum performance. The M2 driver has an assortment of features that makes it stand out from other clubs in the same price range. Although the price is high, you get a lot of value for the money you are spending. Buyers that already have a good assortment of clubs will find that the M2 2017 will quickly become their favorite go to driver in the bag. Solid graphite shaft that provides the best force possible when striking the ball. To be more specific, it is the Fujikura Pro XLR8 56. This is a big deal for serious golfers and one of the main selling points of this club. With multiple flex options, you gain a competitive advantage before you even look at the other features provided by the M2 2017. Major improvements based on the previous M2 2016. 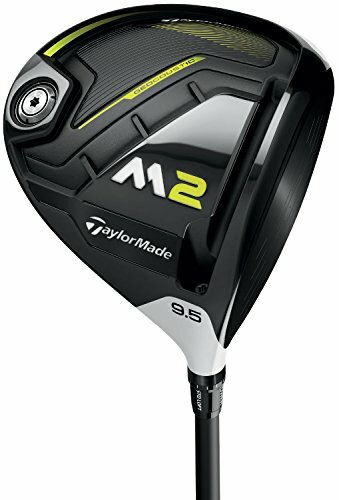 The M2 2016 was the #1 rated driver of its time, and a huge seller for Taylormade. With the M2 2017, they took all of the performance advantages of the previous model and tweaked it into a tougher frame. They also made it a tad lighter so that the balance really worked itself into a full golf swing. Previous owners of the older generation will instantly feel gratification with the 2017 version. High accuracy is possible with their Geocoustic technology. This combination of materials and design helps golfers with bad accuracy and also gives them a bigger window for errors. One of the reasons that is possible is due to the sunken sole portion of the driver. Using multiple materials to form a solid base, the M2 2017 will be your most forgiving driver out of an entire golf bag. Incredible design that doesn’t take away from the original look. This will please players that want to use their originals side by side with the new M2. Loft choices vary from 9.5, 10.5 and 12 degrees. It is a nice range of choices to get your trajectory just right. Although a fourth option would have been nice, it really wasn’t necessary since the three options they provided were spot on. Higher skilled players will prefer the 9.5 while less experienced players can get a lot done with 12 degrees. At about 10.5 degrees you get a nice middle ground for experimentation for both intermediate and professional players. It is one of the few times where a company gave just the right amount of choices without overdoing it. It’s impossible not to compare the 2017 and 2016 M2 drivers. The 2016 still remains an incredible driver for everyday golfing. It revolutionized the game for players that wanted a more forgiving club but on the professional level. Where the M2 2017 wins is with a higher MOI and stronger materials. That is why the higher price of the club doesn’t bother potential consumers that want the best available from Taylormade. If it is within your budget, then it is a must have driver. The way they improved the toughness and durability of the driver without overly increasing the weight is incredible. A lot of times, extra bulk is a necessary evil when modernizing an older club. Taylormade somehow kept the weight low when using their mixture of top end materials. What the buyer gets is a club that can take harsh conditions, punishment and a little bit of mishandling. In the first year that might not seem like a big deal. But years later it will really make a difference, and will fully justify your pricey upfront purchase. Well there is no escaping the price here. You get a lot for your money, but it’ll cost you- for all variations of the M2 2017. This is a tougher pill to swallow for beginners that want to dive into the deep end with their golfing equipment. Although this driver isn’t meant for them, it can be a tempting buy if they are dead set on a high end club. There are other expensive clubs that are more favorable to beginning golfers, so if you are on that level, the M2 2017 is a tough sell. For those buyers, the M2 2016 might be a better buy. Several different drivers come out a year from different companies. Taylormade continues to dominate the list, landing in everyone’s top ten. The M2 2017 is another one of their big winners that deserves a lot of praise for being at the top of its class. This pricey yet capable driver is the real next level of golf clubs.